ACRS President, Lauchlan McIntosh AM, today released the 2014 ACRS Submission to the Australian Road Safety Community, a comprehensive report informing all stakeholders, including the general public, of the opportunities that are available to address the serious issue of road deaths and injuries in Australia. The causes and consequences of road trauma severely impact the productivity of Australia as a nation, as well as impacting on our international reputation, specifically as road safety leaders. The impact of road trauma is felt across all federal departments, and exists regardless of which party makes up the majority in Parliament. Therefore a united effort is required to adequately address this serious issue, arguably one of the highest ranking public health issues we have in Australia today. Reducing road trauma must be at the forefront of the Australian productivity and national economic debate, not simply a factor in transport management. The purpose of this submission is to draw attention to this vital subject, and to call for greater coordination of our response in addressing this major public health issue. Road trauma is arguably the highest ranking public health issue we face as a nation today. Each week in Australia 25 people die and 600 are seriously injured, and the ripple effect of each road trauma event to our families and communities is enormous. Federal government estimates put the annual cost of road trauma to our economy at $27b (Australian Transport Council, 2011) – more than the size of our national defence budget. 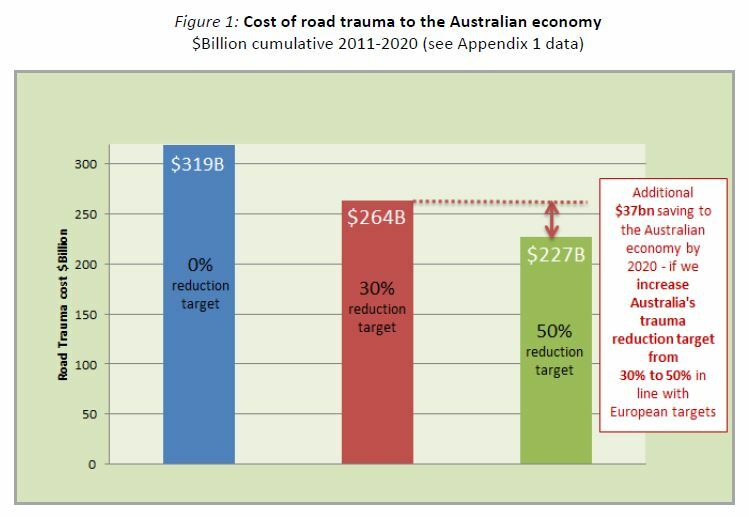 If the aim of the National Road Safety Strategy (NRSS) is reached – a target of a 30% reduction in road trauma by 2020 – this trauma will still have cost the Australian economy a massive $264b over the decade to 2020. If we increase Australia’s target to 50% (in line with the goals of Europe) we will have saved the economy $37b by 2020. More importantly, countless lives and injuries will be saved as well as the ripple effects that will be felt across Australian society. Notwithstanding the impacts to society, the current level of economic impact from road trauma is simply unacceptable, and must be recognised as a significant factor hindering Australia’s productivity. It is only in this way that we can collectively expedite reductions in road trauma. The potential economic and social gains to Australia must not be ignored. It is now apparent that Australia’s performance in generating road death and injury reductions has not kept pace with world’s best standards. As detailed in the body of this report, Australia’s performance has not improved to the same degree as many Organization of Economic Cooperation and Development (OECD) countries since the year 2000. Australia’s ranking has therefore been slipping, and we need to commit to measuring our achievements on a global scale if we are to make the progress that our society deserves. The NRSS, launched in 2011 and now being reviewed, still has no cohesive action plan or budget linked to the proposed achievements, despite the efforts of many federal, state, professional and other bodies mentioned in the body of this report. 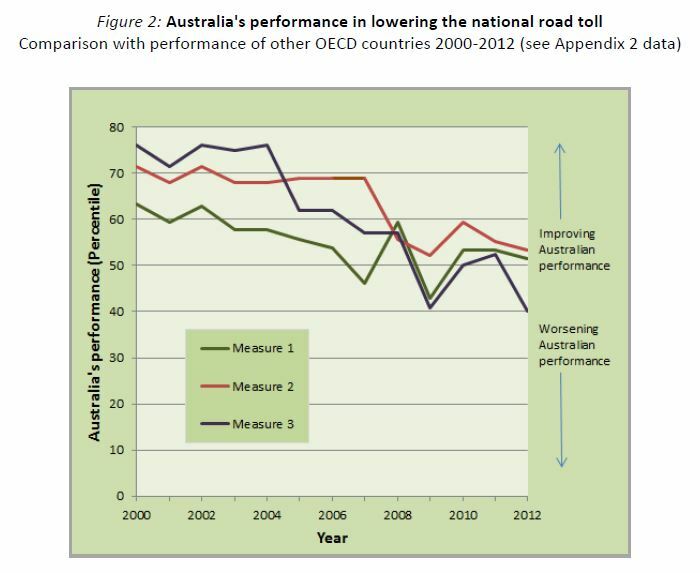 This report outlines potential reasons for Australia’s declining road safety performance against international OECD reductions, and puts forward suggestions for improvement – many of which lie with an increased commitment to collaboration. Remain courageously patient (and committed), and celebrate the achievements! Please read the Complete Submission here. Please use this document as the basis for discussion amongst your stakeholder networks. Join us in circulating it widely – to your political leaders through to your communities. Above all, help us all to work together to achieve greater road trauma reductions. We welcome your comments, suggestions, and above all, support for the proposed recommendations.